Itching for a Byron Bay getaway? We’re lusting over The Barefoot Bay Cottage’s picture-perfect interior designed by The Designory. Gosh Byron Bay really does seem to be the 'it' location for the best designed accommodation, although they usually come with a not so nice price tag! But if you’re in a larger group, sharing this gorgeous cottage might be for you – it has 3 bedrooms that sleep a maximum of 8 adult guests (or up to 10 for families). Newly renovated this home is only a short stroll to Byron town. Cleverly designed to capture both winter sun and cooling summer breezes, it’s surrounded by lush tropical gardens, plunge pool, wrap around decks and outdoor bath. Ahh, sounds like bliss. The house has fully ducted air conditioning throughout as well as a fireplace and outdoor heater for the winter months. A stand-out feature of the property is its huge wrap around deck and outdoor entertaining area featuring oversized built in bench seating, multiple lounges, hanging chairs, a ten-seater outdoor dining table, plus an outdoor bath tub, shower and plunge pool. 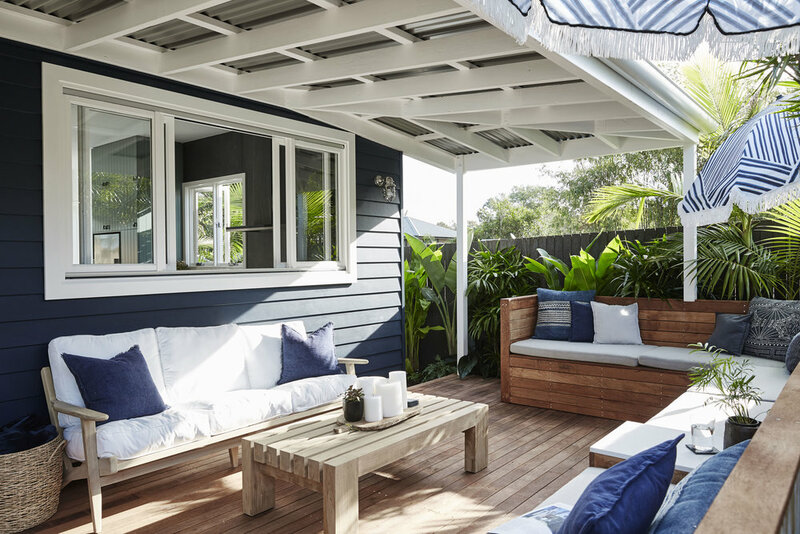 If you’re planning a winter vacay, there’s even an IXL Fresco Auora outdoor heater to ensure that guests can enjoy the beautiful year-round Byron Bay climate. I think I may need one of these should I move to Toowoomba! Like what you see? You can book a stay at The Barefoot Bay Cottage through Airbnb (click here).